Barcelona increased their lead in La Liga to four points after beating Real Madrid 2-1 with goals from Jeremy Mathieu and Luis Suarez. Carlo Ancelotti men played an impressive first 60 minutes and deserved to score more than one goal, but they made two defensive mistakes that allowed Barca to take the lead and play very comfortably during the last half-hour. Luis Enrique men struggled to control possession from the start, with Real’s midfielders exerting a high pressure on Javier Mascherano, Andres Iniesta and Ivan Rakitic. Los Merengues were dangerous in attack and they had the first chance as Karim Benzema picked up the ball inside the box and assisted Ronaldo, who fired a shot straight at the crossbar. The hosts barely threatened Iker Casillas in the first half, but they scored in their first chance. In the 19th minute, Leo Messi sent a precise cross from a free kick and Mathieu headed the ball into the back of the net. Despite the goal, Los Merengues kept controlling the game. Marcelo and Benzema were a nightmare for the Azulgranas’ defence. The Brazilian had a good chance to level after dribbling three opponents, but his right-foot shot was blocked by a defender. The goal finally arrived in a superb collective play. Luka Modric sent the ball forward to Benzema, who produced a back-heel into Ronaldo. The Portuguese poked his effort into the bottom corner. Los Blancos could have taken the lead before half-time. Gareth Bale scored after receiving a pass from Ronaldo, but the goal was disallow for offside. Minutes later, he caught a loose ball inside the box and sent a shor-range effort wide off the post. Barca were completely out of the game until Luis Suarez received a long pass from Dani Alves, run faster than Pepe and beat Casillas with a precise shot. That was a big blow for Los Blancos. Ancelotti men seemed completely demotivated after that, and Barcelona started having one chance after another. Neymar was close to scoring as he danced into the final third before attempting to place one into the top corner, but his effort cleared the crossbar. The Brazilian missed another great opportunity five minutes later as he received a pass from Messi and fired wide of the near post. Jordi Alba and Messi also came close to making it 3-1, but Casillas made two brilliant saves that kept Los Merengues hopes of levelling alive until the last minute. However, the visitors were exhausted and they couldn’t savage a point. Madrid were at least able to keep the goal-average in their favour since they had won 3-1 at the Santiago Bernabeu. 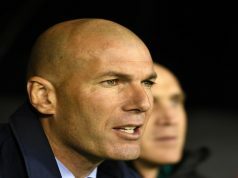 If both teams earn the same points at the end of the season, Los Blancos will lift the title. It’s a real shame that with all these expensive and quality players Real can not win important matches. I don’t know who to blame but frankly the coaching staff is not doing a good job at all. The president doesn’t want to face the situation because they won too many trophies last year. But really, before their elimination in the C. L , somebody has to do something . There is no reason to loose everything after being a world champ. As they play right now, it will be a miracle to beat Atletico. ….